Here’s my latest The Other Side column for ConservativeHome, published here yesterday. I’m worried I’m losing my touch, though… Not only have most commenters there said it’s a fair take (“This is a balanced article by Stephen Tall”), but Toby Young praised it as “a good round-up of where the parties currently stand” in the Telegraph today. My thanks as ever to the site’s editors, Paul Goodman and Mark Wallace, for giving a Lib Dem space to provoke … constructively, I hope. 2013’s on its way out, 2014’s almost here. So here’s my assessment of where the parties are at and what they have to look forward to as the May 2015 election draws ever nearer. 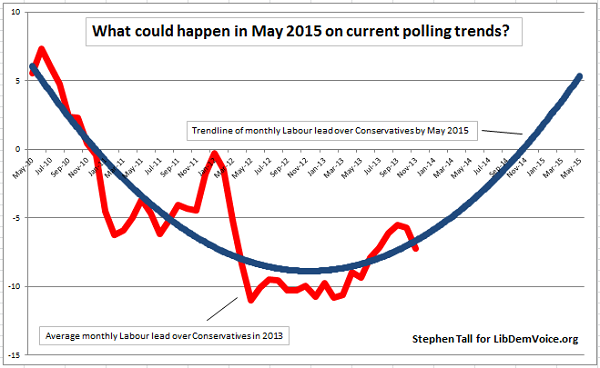 Look at the headline poll ratings and Labour should be happy. They’re consistently scoring 38-39 per cent. True, that’s down on the 40+ per cent they were reaching in 2012. But it still gives them a comfortable cushion thanks to the out-dated constituency boundaries – remember it’s possible for Ed Miliband to become Prime Minister on just 35% of the vote. So why do Labour supporters look nervous? Their worry is summed up in this post on the feistily independent Labour Uncut website: ‘No opposition has ever won an election while being behind on both economic competence and leadership.’ With economic growth returning, Labour has deftly segued their economic attack. The assault on public spending cuts that go “too far, too fast” has been ditched, and in its place is a new refrain, “the Tory cost-of-living crisis”. It’s an ingenious line, tapping into the lag between the nascent recovery and people’s wages, with Ed Miliband’s populist pledge to freeze energy prices for 20 months offering his activists a morale-boosting policy to flog. But, like a bald man’s comb-over, it cannot conceal the glaring truth, that Labour has no good answer to the Coalition’s inevitable economic pitch in 2015: don’t hand the keys back to the driver who crashed the car. The Conservatives, too, are anxious – though with more evident good cause. Their polling is also consistent, at 30-31 per cent, which could mean a loss of up to 100 MPs. Membership numbers were finally published (thanks to pressure from this site) and revealed to have halved since David Cameron was elected leader eight years ago. Lord Ashcroft’s research shows them to be trailing worse in the marginals they have to win than in all other seats. Trickiest of all, the insurgent Ukip means there is now a genuine competition on the right of politics. Mr Cameron finds himself pulled in different directions, shoring up his base with immigration crackdowns and anti-EU rhetoric, while trying simultaneously to placate those Conservatives (including many of his A-lister MPs) wooed way back when he was promising to “let sunshine win the day”. 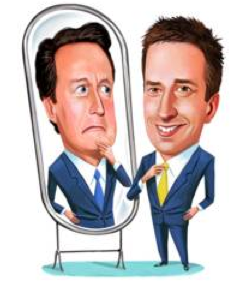 The Telegraph’s well-connected Ben Brogan records that “It is difficult to find Conservatives willing to say privately that they will still be in power after polling day.” Are they right? As it stands, yes. The reason is simple: the Conservatives will not be the biggest single party in the Commons (let alone have an outright majority) if Labour polls more than 35 per cent. Don’t despair just yet, though. There’s plenty of precedent of unpopular governing parties bouncing back from a mid-term slump. Here’s my implausible-but-not-impossible scenario based on current polling showing how the Conservatives could yet bounce back to take a six per cent lead over Labour. There’s no hiding it – Ukip has enjoyed a fantastic year. David Cameron’s 23rd January speech committing the Conservatives to an in/out EU referendum by 2017 was designed to “shoot the Ukip fox”. Predictably, it did no such thing, merely escalating the issue of Europe on which Ukip retains its USP intact as the only party committed to withdrawal from the EU. We’re used to Ukip polling well in the European elections then largely fading from sight – but this year the Faragistas proved themselves well-capable of mounting an advance beyond this comfort zone. They pushed the Conservatives into third place at the Eastleigh by-election and came within a whisker of repeating the trick at the local elections. Few people would bet against them topping this May’s Euro poll, a feat which could yet spook Tory MPs no matter how ‘priced in’ such an outcome is. Immigration is riding high in the polls as an issue of key voter concern, and the focus on a potential influx of Romanian and Bulgarian migrants when labour market restrictions are lifted on 1 January 2014 is likely to keep it there. Yet the polling on immigration also highlights the biggest threat to Ukip’s poll ratings. As Peter Kellner noted here last year (and it still holds tue) while voters place it second on their list of national issues, it trails pensions, health, tax, family life and education as issues that ‘matter most to you and your family’. Those are the hot topics which will dominate a general election campaign. And as generations of Lib Dems will attest, mid-term poll spikes can melt away so quickly when voters finally plump for the party they want to govern Britain. Flatlining. It’s the word that has been used most often to describe the British economy in the past three years, but it could equally apply to my party’s poll ratings. We’re stuck at an average of 10 per cent, have been since December 2010. Like the Tories our membership numbers have taken a tumble, down by a third to 42,000. Some 2,500 of them are councillors, our lowest figure since 1984. For a party more reliant than most on the valiant footslogging of dedicated activists fighting for ‘their patch’ that’s a tough decline to bear. We face another tough set of local elections, and there is a distinct possibility the party could finish fifth in the Euros. Yet the successful defence of Eastleigh showed that the Lib Dems are hard to get rid of once we’re entrenched – “cockroach-ish”, as party president Tim Farron colourfully described us – and it is this which gives hope that more of our 57 MPs will survive than a simple uniform poll swing would imply. The other glint of light is the failure of both Labour and the Conservatives to convince the voters they have what it takes to govern alone. The party’s strategy – more responsible than Labour, more humane than the Conservatives, expressed in the mantra-like slogan ‘Stronger economy, fairer society’ – was thrust on us by the disappointing 2010 election result. With no chance of forming a government or becoming the official opposition, the Lib Dem task is to persuade voters we’re their best guarantee against excessive Tory cuts or a reversion to Labour extravagance. Inspirational it’s not – but it does at least have the virtue of being realistic.